This tutorial explains how and why people and companies are sending television programs through IP data networks. You will discover how global television services are already available through broadband networks such as the Internet and how you can use standard television to watch global television channels using analog television adapter boxes. 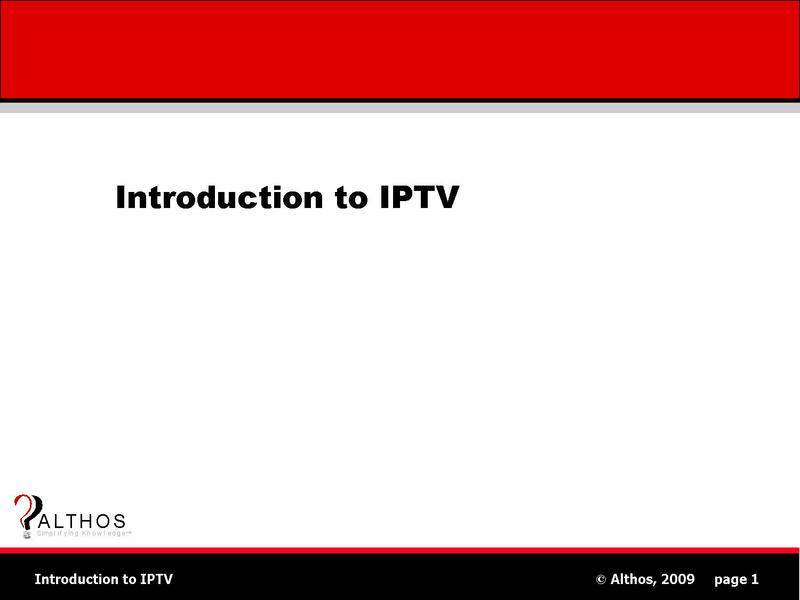 The fundamentals of how IPTV works is provided. You will discover how IP television can be watched on different types of viewing devices such as standard televisions with adapters, dedicated IP televisions, multimedia computers and mobile telephones. IPTV service allows viewers to have more control of Internet television services. This control ranges from instant service activation to real time television on demand controls. Some of the advanced Internet television features such as personal media channels, anywhere television extensions, global television channels and multimedia programs are described. In addition to the traditional ways of television channel selection, you will learn about new ways television channels can be search and selected using interactive electronic programming guides (EPGs). The different types of media formats that are used for IP television services are explained along with their control protocols. Not all IPTV systems and services are the same. There are cost and quality tradeoffs along with common problem areas and risks. You will discover how the audio and video service quality can range from poor to above the quality that is already delivered to standard TV. Because each IP television viewer has a unique address, this allows advertising messages to be sent to specific viewers (addressable advertising). The ability to direct advertising messages to specific target audiences (addressable advertising) is more valuable to companies than traditional broadcast advertising and this may result in reduced viewing costs.